I have used both 10"and 20 " filters. Best filters I have ever used. So don't use cheaper imitation. These last much longer when tested for chlorine. It works out cheaper in the long run. This unit will be used in a caravan which has an internal water tank .The end fittings have to be changed to except a rigid 12mm pipe. Most caravans use semi, rigid 12mm OD water pipe. Great value, super quality just what I needed. I purchased the replacement set of filters just as a back up from ordering a full R.O. filter the week before.knowing I would be replacing them within about six months, I am really impressed with this company and with its knowledge of filter systems and prices of replacement parts. Very Happy With The Flow. 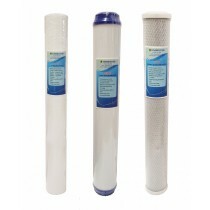 My previous choice of filter was the Pentek CBC range which lasted 7 months which they controlled the chlorine levels very well but suffered a little towards the end of their life with reduced flow rates.... So I opted to change the the floplus range , wow flow rate is massively improved early days yet but I'm very happy with the early performance.